Start out simple and grow into solutions that will offer flexibility and interest of your constituency. As the technology evolves, you can be assured that we will be there for you. Let us demonstrate how our formats can be used on social media and the wide array of devices such as computers, smart phones and tablets, thus enabling the reader multiple viewing options. 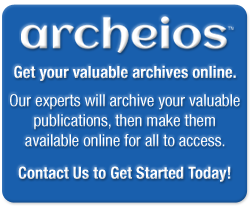 Utilize our “Archeios Website Tools” that are designed specifically to share your assets the way your audience wants them.